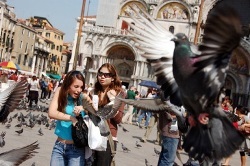 From this May 7, feeding pigeons in St. Mark's Square will be illegal. Tourists that feed pigeons and are caught will be fined 50 Euros, ca $80 USD, on the spot. The grain sellers that have traditionally lined St. Mark's Square since a century past have also been banished from the city, and it's now illegal to sell the bird feed anywhere in Venice, Italy. The pigeons are blamed for eroding the city's marble statues and buildings by pecking at small gaps in the facades to reach for scraps of food that were blown inside. Pigeon droppings are also corrosive and will speed up any decay of the city's architectural beauty. One study estimated that cleaning up monuments and repairing the damage cost each Venetian taxpayer 275 Euros a year. Naturally, the grain vendors are less happy about the new law, and one banner was flown with "Thanks Mr. Mayor for killing off our business after 100 years of sales." One pigeon feed vendor said that the birds aren't doing any real damage to the city monuments and that the mayor's office simply wants the grain sellers and pigeons out of the square. The battle against the birds is part of a broader campaign to clean up Venice which is a Unesco World Heritage Site and welcomes more than 1 million tourists a month. Last updated by jack on 31 March, 2010 in Travel.